Bali News: A man who was on holiday in Bali and visit Pura Tanah Lot, died of drowning and dragged the ocean waves. 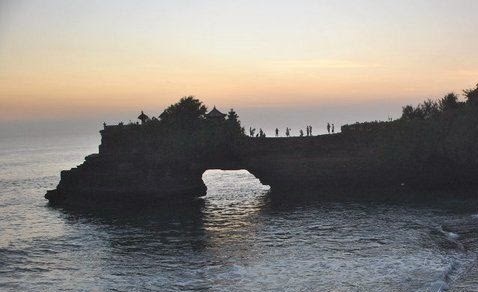 Men who died in the Pura Tanah Lot is a domestic tourists. Male, aged 28 years, native of West Sumba, NTT. He was a crew of fishing vessels in the port of Benoa. He hit the ocean waves while taking pictures with a camera. He drowned in Pantai Batu mejan, west side of PuraBatuBolong in the area of Tanah Lot. The bodies of the victims have not been found. Rescuers are still conducting searches around the coast. But the quest is not getting results. At that time around Tanah Lot sea was high, so that the sea water is very high, and very large sea waves. The man drowned on Wednesday, March 25th, 2015, around 01.00 pm. The victim went to Tanah Lot with the group with the aim to travel, as many as nine of his friends to Tanah Lot by car. While at Tanah Lot, they enjoy the natural beauty around the beach. Around 01.00 pm, the man was heading west Pura Tanah Lot, he headed Pura Batu Bolong. From the temple area, he determined to go down to the beach. At that time there was a warning sign that forbid anyone to go down to the beach because the sea was high tide, and a very large ocean waves. Though the ban boards mounted transversely on the stairs leading to the beach. But the man was reckless and deliberately lifted the ban and open board, and then he went down to the beach. On arriving at the bottom, the man tried to take a picture of himself with camera phonsel. But suddenly the sea waves hit him, he finally dragged sea water and lead it to sink. Attractions of Pura Tanah Lot and beach around dikenala very dangerous. There has been a lot of adverse events experienced by tourists. Many of them died due to drowning. Any changes of sea water and the tide, the officer in Land Lot will put up signs warning. Some time ago, a little boy to death for the same event. The boy also died due to hit the waves of the sea.